An embroidered athletic stripe ensures you reach any fashion finish line in style. The leg-lengthening detail adds a pop of Skinnygirl red to your picture of perfection. Made from Injeanious Stretch denim for superior stretch and recovery. Excellent jeans ,the fabric is wonderful fits perfectly will order again .love Bethenny. Love these jeans. Very stylish and comfortable. Will keep buying more as new styles come out. So Pretty in the Light Wash! I own both the dark and light options in this red side strip jean. There's something a little more striking about the lighter version. Amazing fit & so soft, comfortable & flattering. I own just about everything on this Skinnygirl Jeans page, buying here & there. SGJ is like potato chips to me, ONCE you start buying them, you just can't stop! Bethenny is really bringing it!!! I love everything SGJ! 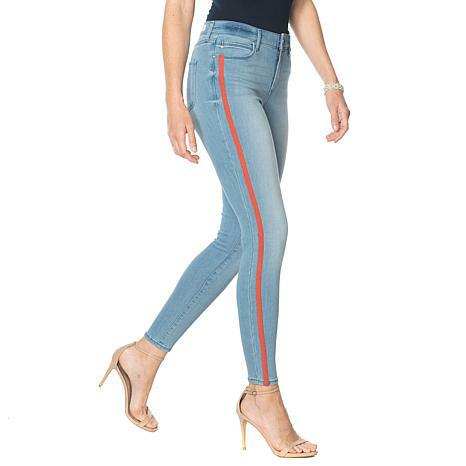 I have never spent this much on jeans, but hearing the description and hoping for the best quality I took a chance because I love the look - the stripe is so cool. I love them! One tiny bleach or lighter color smear/line of imperfection on thigh of right leg, but it's tiny - definitely a mistake BUT I can overlook because can't see it from afar. Very soft and comfy, and true to size. I am plus sized and I think these are flattering. Bootcut jeans please! A TS would be nice too. Inspired by the authentic personality of its founder, Bethenny Frankel, the Skinnygirl brand offers sensible solutions with a little extra flair. Anchored in premium denim, the collection features fashion-forward jeans, tops and jackets designed for ageless women who embrace trends, expect quality and want to look their absolute best. Remind me about Skinnygirl upcoming shows.